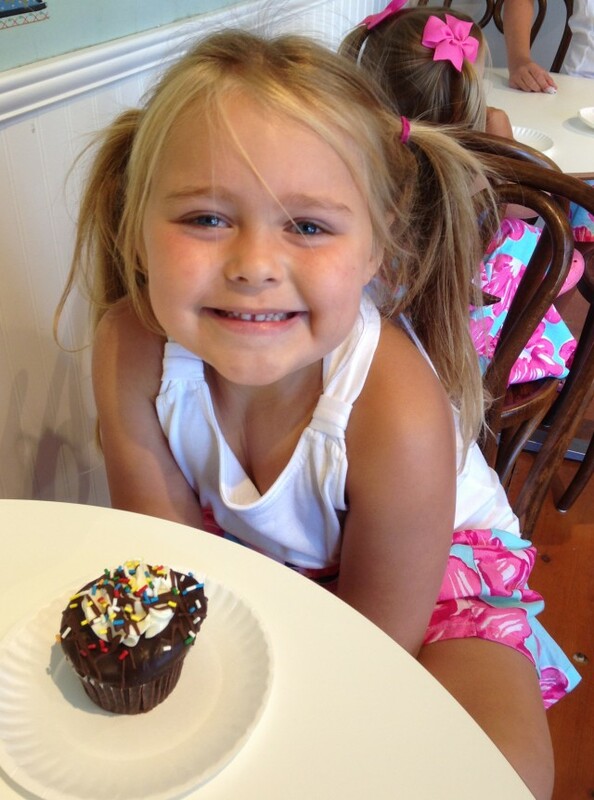 The Summer of Food Allergy “Firsts” – Ice Cream, Pizza, and Cupcakes, Oh My! As food-allergic individuals or food allergy parents, it’s all too easy to focus on the fear and the negative of food allergies. Sometimes, the best we can do is remind ourselves that there are many worse conditions in life – and then live life to the fullest. After all, despite food allergies, most afflicted children and adults can participate in almost all “normal” activities. That’s not true for everyone. But every now and then, we find a moment to cheer about. Sometimes it’s as simple as finding an exciting, new, unexpected food option. This Summer, I’ve been blessed to be a part of what I’m calling the “Summer of Firsts.” What does that mean? It means I participated in an event where many food-allergic children (including those with dairy allergies) had their first ice cream out. It means I watched my multi-allergic son eat his first calzone. And it means that I got to hear the story of a mom who watched her peanut- and tree nut-allergic daughter eat her first cupcake. To experience so many of these in such a short period of time is awesome! In early June, my children’s school held its annual Field Day for their K-8 students (the extremely allergy-friendly Inly School in Scituate, MA). In prior years, one of the Field Day stations served ice pops – a safe treat for all the kids in the school. This year, however, “we” made a bold change. Why does this get me excited? The key is that, due to their unique process, Sub Zero can accommodate most allergies – even dairy! They don’t need to use regular milk – they can use soy milk, almond milk, coconut milk, rice milk, you name it! (I believe they only regularly carry soy and almond in their Nashua stores.) And they don’t just have one or two choices for those with dairy allergies – they can make almost any of their flavors dairy-free (assuming no dairy in the actual flavoring)! Their process also makes it easy for them to avoid cross contact. What about peanuts or tree nuts? Simple enough. They can either wash the very basic equipment used to make their ice cream or maintain dedicated equipment. Suffice it to say that they can accommodate almost any allergy, as well as gluten-free. So with that knowledge in hand, and after getting to know owners Rita and Mark, I asked if they would drive their mobile ice cream truck from Nashua, NH all the way to Scituate, MA. I badly wanted all the kids at Inly School to be able to eat ice cream! All parents were, of course, notified, with just 3 opting out. 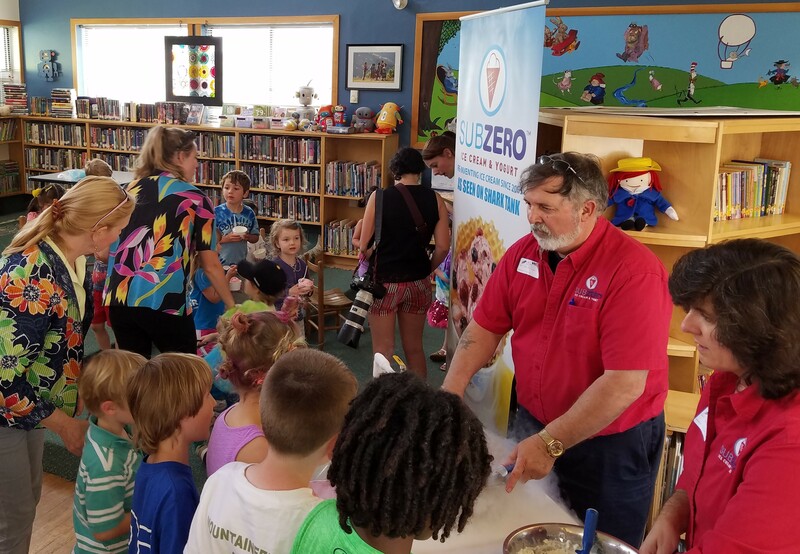 Students – with and without allergies – enjoying Sub Zero’s ice cream. The results were spectacular! 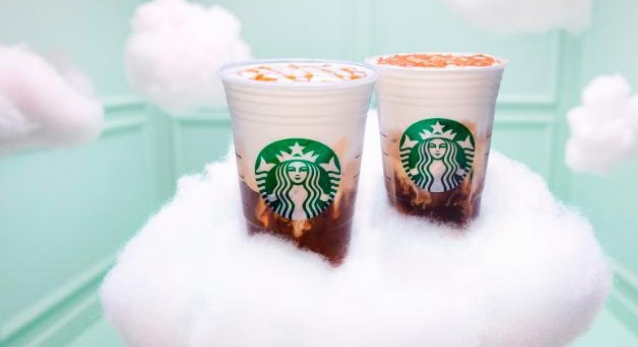 While they couldn’t bring everything from the store, they brought regular milk, soy milk, and rice milk, as well as chocolate, vanilla, and bubble gum flavors. 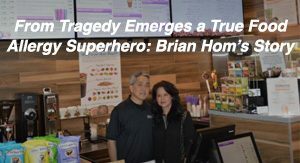 They made each of the flavors with regular milk all day for those without allergies; however, when a student with a food allergy arrived, they pulled out a dedicated bowl and spatula to make that student’s ice cream individually for him or her. 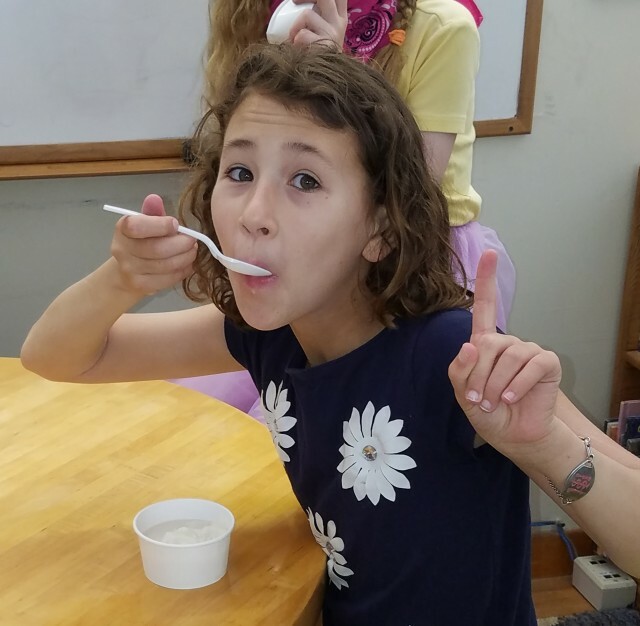 Quite a special day as MANY students enjoyed their first non-packaged ice cream ever, with one class even applauding Francesca (below) as she ate ice cream out for the first time. Francesca eating her first ice cream from a real ice cream shop! My family makes an annual pilgrimage each year to Sea Island, GA – a beautiful vacation destination for all ages. We rent a big house – enough to fit 11 of us – so we have the opportunity to cook for ourselves… but who really wants to cook on vacation? 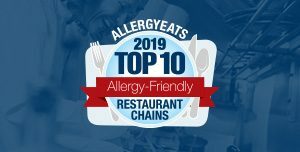 We’ve found some allergy-friendly hidden gems down there (don’t miss the famed Southern Soul Bar-B-Q), but, as with anywhere else, we’ve also had our fair share of challenges. This year, we found Mellow Mushroom. 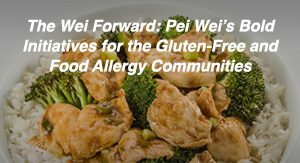 Being from the Boston area, I’ve never seen one before, but I’ve read a ton of positive reviews about them on AllergyEats, including from those dealing with dairy allergies. So we decided to check it out. 7 of us visited, including my 3 food-allergic children, one of whom (Keegan) has dairy on his list of allergies. Now, we often order pizza at our house on those lazy days where we just don’t want to cook. 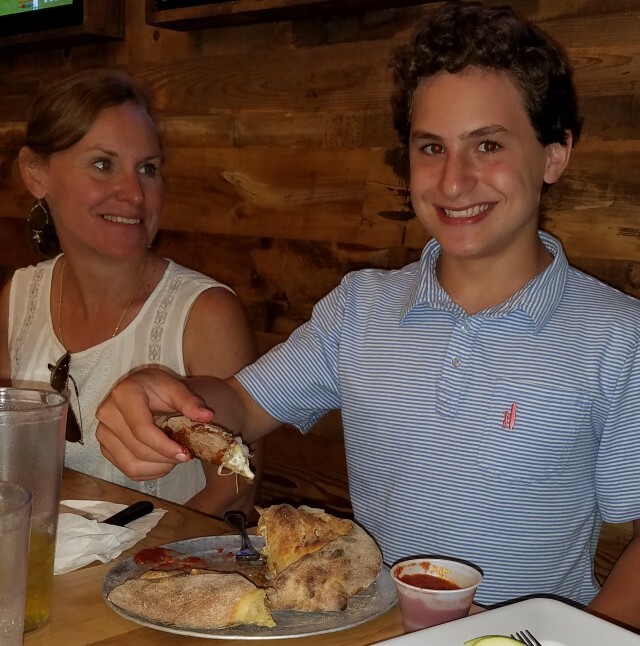 Keegan always happily enjoys his no-cheese, hamburger pizza – though deep-down I’ve always felt it’s a shame that he can’t have regular cheese pizza. However, at Mellow Mushroom, we were excited to see that they carry Daiya cheese and can use it on anything they make! Hello first cheese pizza for Keegan! Keegan enjoying his first dairy-free calzone at a restaurant. Who doesn’t like a good cupcake? And how many food allergy parents feel terrible the first few times they send their child to a birthday party with their own treat, not able to eat what’s being served (even if their child still likes their “special” treat better). Fortunately for those with peanut- and tree nut-allergies, in particular, bakeries have been popping up for 10 years that are “nut free.” May others have also been emerging more frequently with the ability to accommodate other allergies as well. Enter Kristi. Kristi was traveling with her girls, age 5 & 8, from Chicago to the Boston area. She was seeking food recommendations from the No Nuts Moms Group of Boston Facebook group – specifically a place to find bread with no possible peanut or tree nut contamination. Fortunately, my AllergyEats colleague, Sharon, saw her post. Sharon replied, “I can’t help you with the bread, but how about a cupcake!” and pointed her to Sadie Mae’s Cupcake Café in Hingham. Her youngest daughter had never been in a bakery, so they planned to visit Sadie Mae’s the next day. The rest is (great) history. The picture below of little Madison in Sadie Mae’s says it all. Another food allergy “first” to feel great about! Madison eating her very first tree nut- and peanut-free bakery cupcake. I love using this phrase from my old investing days – the trend is our friend – but it’s even more applicable here. Around the country, in restaurants and supermarkets, at ball games and in airlines, at schools and camps, people are starting to “get it.” Not everywhere, for sure, but… well… the trend is our friend. We are a large enough portion of the population, representing a “condition” that is clearly not going away, that business owners, school administrators, and others are realizing that this is the new norm. 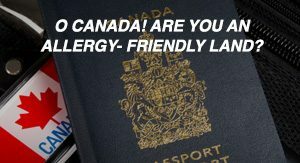 Accommodations must be made for those with food allergies – whether for legal reasons, for moral reasons, or for business reasons. But the bottom line is that new “firsts” will continue to happen every day! Enough about me, let’s hear from you! C’mon, let’s take a day off from the dreary side of food allergies and share those high-five moments. Tell me about a first that you or your child have had. Share the experience, your feelings, even a picture, whatever. Today’s a feel good day! I live in London, England, and if anyone’s here with family or friends with allergies, it’s worth trying Yorica, in central London. 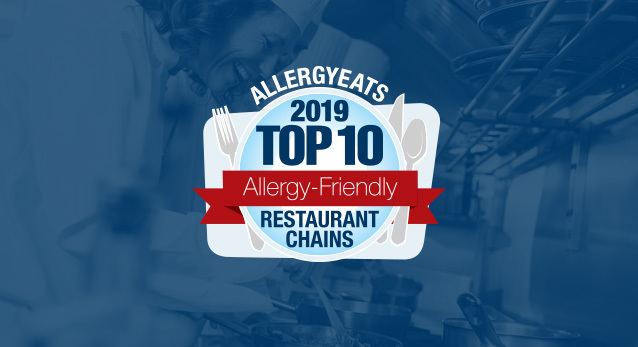 They use no egg, dairy, gluten or nuts and have strict tracing policies on cross contamination risk, including to sesame and other allergens on the EU’s list. My daughter, who has severe (anaphylactic) allergies to sesame, mustard, fish and lentils, had her first ice cream in a place where she could have anything she wanted, including all toppings which she could never have in a regular ice cream shop. Huge smiles all around! I did not develop an allergy to peanuts and tree nuts until about five years ago. I love desserts, and I used to order them everywhere. Now it’s very rare that I can. And I have always felt sad passing by a bakery, because I know the likelihood of being able to walk in and buy anything safe is next to none. Recently, a friend told me about Sweet Megan’s, a bakery that does not use any of the top 8 allergens. When I walked in, I was overwhelmed that I could buy anything I wanted. I got two cupcakes and two cookie sandwiches, and stuffed a cupcake in my mouth before I even got out of my car in my driveway. It was delicious!!! I’m so happy that there’s somewhere I can go to just get a cupcake when I want one! Thanks to Pizza Fusion in Ridgewood, NJ my son had pizza out for the first time!!! It’s so exciting when you find something safe for the WHOLE family.